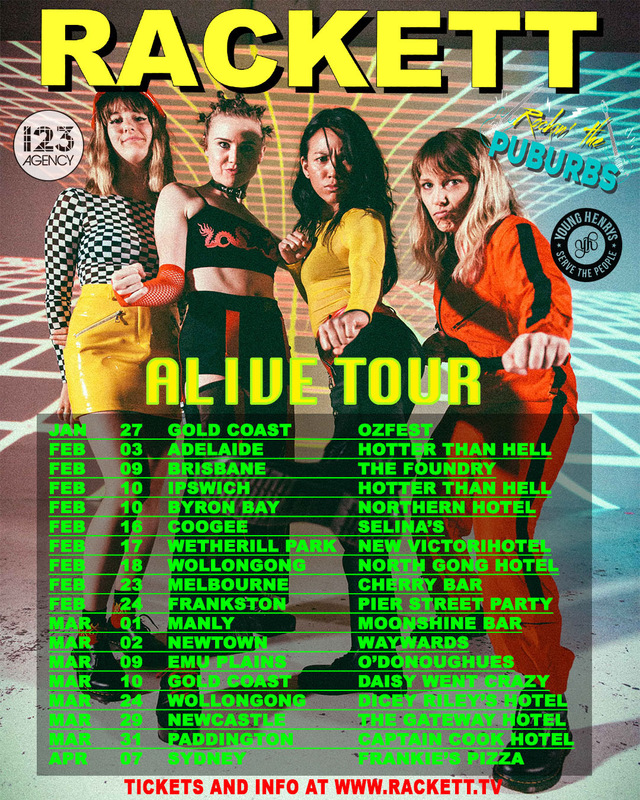 Fiery four-piece Rackett have announced they’ll be off on their largest tour to date with a mammoth 18 dates across New South Wales, Victoria, Queensland and South Australia through February, March and April. New South Wales dates in the tour were organized with the support of AHA NSW as part of their Rockin’ The Puburbs competition. To celebrate the huge step forward Rackett have released their new single Alive; a bouncing, existential banger undercut by buzzing synth and running bass. Alive is a truly existential track tackling themes of material mortality and the infinitely evolving attention of popular culture; all wrapped in the infection, hard hitting pop-rockRackett has refined to a point! Alive is the fifth single from Rackett following on from the rocking success from singlesPrey, Ready or Not, BATS and Your Son. “Working with AHA NSW through Rockin’ The Puburbs is giving us the opportunity to play in venues and reach audiences that we couldn’t have on our own. Pubs like theCaptain Cook Hotel, Dicey Riley’s and O’Donoughues are where so many Aussie’s first experience live music and we’re so excited for them to experience us,” said Rackett.